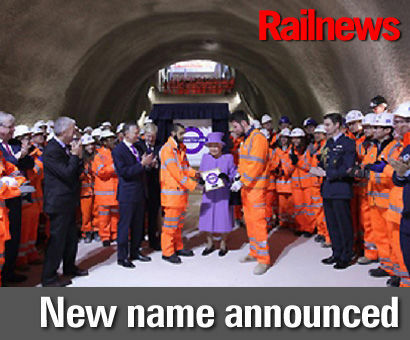 LONDON'S new underground railway, which has been built as Crossrail, will have a new name when trains start running in 2018. Her Majesty the Queen visited the station site at Bond Street today, where the Mayor of London announced that the route will be known as the Elizabeth Line. The Queen, who is 90 this year, toured the site this morning with transport secretary Patrick McLoughlin, London Mayor Boris Johnson, transport commissioner Mike Brown and Crossrail chief executive Andrew Wolstenholme. She was presented with a commemorative Elizabeth roundel, and met a number of people involved in the construction of Crossrail, including apprentices, engineers and future train drivers. The Queen has made a number of visits to the Underground during her life, starting in the 1930s when she was taken for a ride as a young Princess on an Inner Circle train. After becoming the Sovereign in 1952, she travelled in the cab of a Victoria Line train to celebrate its opening in 1969 -- an event which was also notable because when she was invited to 'buy' a ticket, the machine rejected the Royal sixpence. She opened the first Underground station at Heathrow -- originally Heathrow Central -- in 1977, and on a less happy occasion she unveiled a plaque to commemorate the victims of the 2005 London bombings at Aldgate station in 2010. Most recently, she visited Baker Street station in 2013 to celebrate the 150th anniversary of the Underground.